The house remodel is nearly done with only the master bedroom and a punch-list to complete. In celebration that the light at the end of the tunnel is not a train, I invited a few friends over for a day of music. 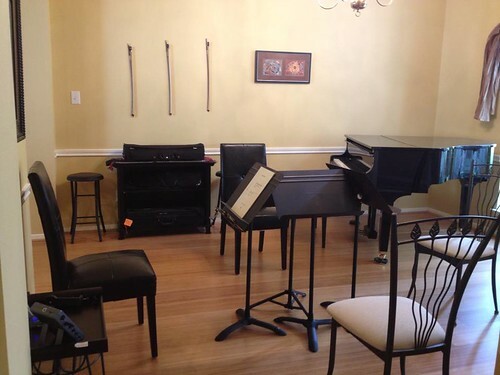 First there was the matter of preparing some lunch for my guests, then setting up the new music room for a quartet. Ahhh, the joys of "furniture" arrangement! I had to move my bookcase off to the side to fit everyone around the piano, but managed to make it work. It made me re-think where the piano's final home should be. 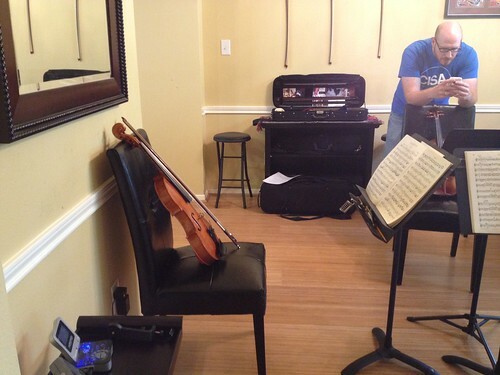 After a second tour through the house, we started with a warm-up on some birthday variations for a friend of our 2nd violinist that was due to arrive in the afternoon, and a scale played in 3rds. We got down to business the Sunrise quartet by Haydn. We decided to just play it straight through, repeats and all for the first time. Oh, the joys of an acoustically live space! I believe it was the best we ever played the piece - even with a stop & restart or two. In acoustically "dead" rooms, it is all to easy to keep playing louder and louder in order to hear yourself, and intonation as a group can be difficult to judge. In a "live" room, dynamics and intonation issues are blatantly apparent and tend to be corrected very quickly. After running through Sunrise once, we tackled the last piu Allegro and piu Presto portion for some more dramatic tempo changes. We deferred to our first violinist for determining our "maximum speed". To our pleasant surprise, she wanted to do it again and again, faster and faster. A year ago, she played 2nd violin and didn't speak up much. Well, THAT definitely changed! After nearly killing ourselves, we stopped to take a lunch break around the kitchen island and had tuna salad wraps, cheese, sausages and Chinese tea. This in my opinion is the best part of rehearsals. Not the eating part, but the camaraderie. The four of us outside of the rehearsal space couldn't be a weirder mismatch of people if you tried, but when it comes to music - we are much the same. After our break, we played around with some cello quartets (4 cellos). One was written with 2 parts in bass clef and 2 in treble. I'm not a great bass clef reader even after taking a year of cello lessons, so I swapped instruments with our 2nd violinist so he could take the 2nd cello bass clef part (did I say he used to be a music teacher? ), and me and the 1st violinist on the upper 2 treble clef parts on violins. Talk about musical chairs! After that our cellist challenged me to find something new for us to sight read. After a little digging around, I found my copy of the Rebecca Clarke quartet. When I lived in Portland, the quartet I played with gave this a try and ended up putting it away very quickly. This time, it was much the same. We made it through the first half-page, skipped the middle portion of the first movement, and finished the last half-page of the first movement and put it away. :::sigh::: I'll keep trying. Some day I'll play the entire quartet. We then moved on to something more "predictable" and played Mozart K387. By that time, we'd been at it for 4 hours! Most everyone packed up and headed home except for our 2nd violinist who was waiting on a friend to arrive to head down to the local boardwalk. It was his friend's birthday, so we worked the Birthday Variations he brought, with him on piano and me on viola (musical chairs again!). If you've never heard them before, we took a queue from Rachel Barton-Pine's variations (4:18 from the video below - the minor schmaltzy portion) and applied it our piano & viola rendition. It was a hit! By that time, it was finally time to call it a day - 6 hours later. We have one more rehearsal as a quartet back at our 1st violinist's home, then the cellist and I head up to Interlochen for the Adult Chamber Music Camp. After that, we are a trio again when our 2nd violinist heads back to Atlanta to finish his Master's degree. It was the best day I've had in a very long time. 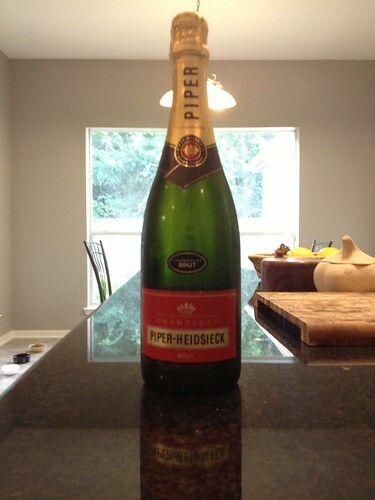 Mendy - Congratulations on the remodel & move- in & delightful musical day. What a wonderful way to celebrate. Sounds like an excellent day, and the music room is to die for. Congratulations. May you have many more days like that. Sure the camaraderie is great... but it's always better when it's fueled by good food & drink... and a lovely setting is always helpful too! Have a blast at Interlochen.